Tonight marks the annual Diplomatic Reception held at Buckingham Palace for the Diplomatic Corps. William and Catherine attended last year, so I thought that the Prince of Wales and the Duchess of Cornwall would be the only ones attending alongside Her Majesty and Prince Philip….that was the first surprise of the night. 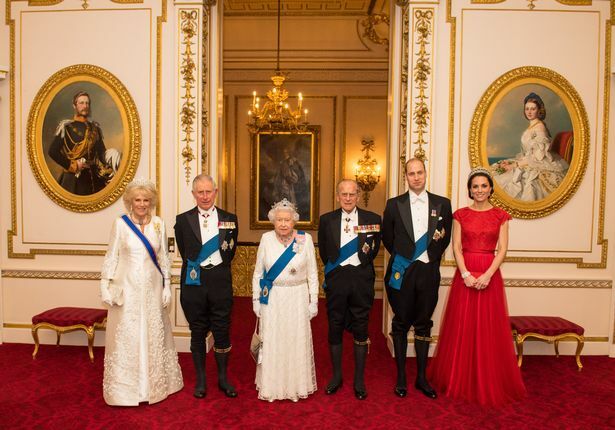 and you’ll notice that that is a full length photo of the Duke and Duchess of Cambridge….that leads us to our other and biggest surprise of the night. For the first time ever Buckingham Palace released a photo of the British Royal Family from inside the Diplomatic Reception. This photo shows Her Majesty Queen Elizabeth II and her 2 heirs, His Royal Highness the Prince of Wales and His Royal Highness the Duke of Cambridge along with each of their spouses. They’ve never released one of these to the public before, understandably twitter is having a bit of a fit over it. Now, let’s take a quick look at Catherine’s Ensemble for the evening and don’t worry We’ll touch on William in a moment. Catherine opted for a few repeats, but they are all things we are happy to see again. 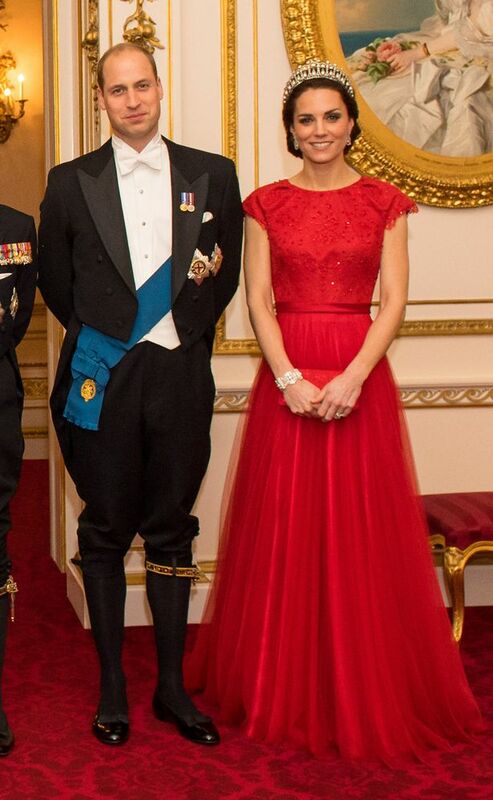 Her red dress is a bespoke Jenny Packham that we first saw when the Duchess of Cambridge attended the State Banquet for the Chinese President. She is also wearing a bracelet that once belonged to the Queen Mother that we first saw her wear at the same State Banquet. She wore earrings that we first saw her wear recently at the Place2Be Awards. She also carried a red clutch that we suspect is one of two red clutches she debuted in Canada, but it is hard to be definitive with these pictures, not being picky or ungrateful mind you just stating a fact. Now, let’s talk about this tiara. When Queen Mary died in 1953, she left the tiara to her granddaughter, the Queen, who wore it with style during many formal appearances throughout the ’50s. However, she later retired the tiara in favor of her other go-to looks, including the Girls of Great Britain and Ireland sparkler. In 1981, she loaned the tiara to Diana as a wedding present, with many thinking the future Princess of Wales would wear it on her wedding day. However, when the big day came, Diana instead chose to wear the Spencer Tiara, an 18th-century family heirloom from her great aristocratic family, the Spencers. Diana still held onto the Lover’s Knot tiara, however, and it became a favorite piece over the years and thus became closely associated with the Princess of Wales. After Diana’s death, the tiara itself wasn’t publicly seen until last year, when Kate dusted it off for the special reception in December. It’s a fitting choice for the princess – not only is it based on a tiara owned by a previous Duchess of Cambridge, but it also has a strong connection to William’s mother. 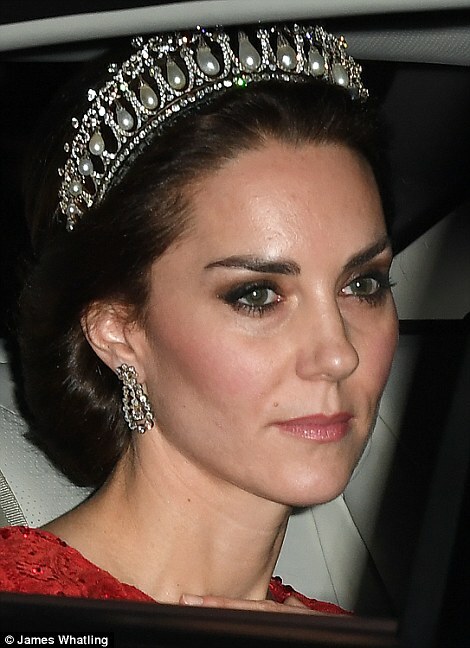 And, historical significance aside, the romantic shape of the tiara aligns with the other tiny tastes of tiaras we’ve seen on Kate, including the Cartier Halo Tiara. William is in full white-tie with both of his Orders and his campaign medals. All of the men are wearing their Order of the Garter breeches. It really is interesting to see the entire look. William, you better get comfortable with those breeches…You’re going to be wearing them for a LONG time.